One Stop Systems has introduced its first external boxes for video cards, which will be offered with factory-installed NVIDIA Quadro professional graphics adapters. The Magma ExpressBox 3T-V3-eGPU enclosures are compatible with both Apple macOS and Microsoft Windows-based PCs. 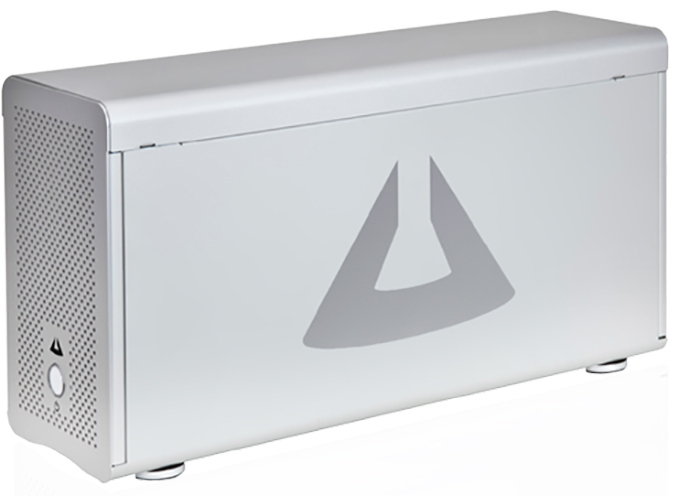 The OSS Magma ExpressBox 3T-V3-eGPU enclosures enable one 250W graphics card to operate with a laptop using a Thunderbolt 3 interface. To ensure quality power supply for the boards, OSS equips its eGFX boxes with a 400W PSU with two auxiliary PCIe power connectors. Furthermore, the enclosures feature a blower with a hot-swappable fan for cooling. It is noteworthy that the OSS eGFX boxes do not integrate any USB hubs or other value-adding devices sometimes found on such enclosures, possibly because the manufacturer wanted to guarantee maximum stability and reliability of its solutions aimed at AI, CAE, and graphics professionals. One Stop Systems will offer its Magma ExpressBox 3T-V3-eGPU boxes with in four configurations with NVIDIA’s Quadro P4000, Quadro P5000, Quadro P6000, and Quadro GV100 graphics cards. Prices of these solutions will range between $2,350 and $12,100 once they become available in the coming months. What are you talking about? Nobody is bound to buy this product. They're not gonna cut their fingers off to do it. The product will just fail if it doesn't offer value.